The Crested Caracara looks like a hawk with its sharp beak and talons, behaves like a vulture, and is technically a large tropical black-and-white falcon. It is instantly recognizable standing tall on long yellow-orange legs with a sharp black cap set against a white neck and yellow-orange face. There is a pair at Anahuac National Wildlife Refuge that have built a nest on a Radio Transmission Platform near Frozen Point. I caught this one posing for me. Great portrait of this proud fellow -- wonderful detail & tack sharp. 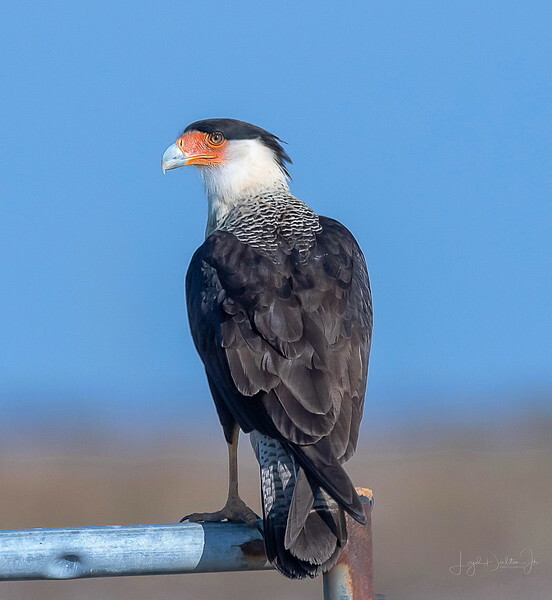 I love seeing the caracaras in Texas--they are so different and strange looking, great bird, great shot of it. Marvelous capture of the caracara...can't get better than this! Lovely detail and great light. Super pose of the bird as well. Superb shot of the Caracara and yes, he did pose very nicely for you. The DOF you chose was spot on perfect! Great shot of this beautiful (but often nasty) bird!